Maria das Gracas Silva Foster has worked for Brazil's state-run oil company Petrobras almost all her career. And now, after 32 years, she is set to take over the running of a company that is crucial to Brazil's economic development. Petrobras, ranked 34th in the Fortune 500 list of companies, aims to become one of the world's biggest suppliers of oil, capitalising on the deep water reserves found off the Brazilian coast. Graca Foster, as she is known, will be in charge of an investment budget for the next four years of some $225bn. After confirmation by the Petrobras board, Ms Foster, 58, will be the firm's first female chief executive and the first woman to run a major oil company. She was nominated for the post by Dilma Rousseff, Brazil's first female president. The two began working together in 1998. When Ms Rousseff became mines and energy minister in 2003, she asked Ms Foster to be her secretary for oil, gas and renewable fuels. Both have the reputation of being tough, no-nonsense operators. "Ms Foster is very hard-working and likes things to be done well," says John Forman, a former director of the Brazilian Oil Agency (ANP). She is not one to easily forgive mistakes, he says. "In this sense, she's like Dilma." But if the two share the same determination to succeed, their backgrounds could hardly be more different. Ms Rousseff grew up an upper middle-class household in Belo Horizonte. Ms Foster grew up in Morro do Adeus, a poor Rio neighbourhood that today is part of Complexo do Alemao, a sprawling and at times violent slum. "I lived in Complexo do Alemao until I was 12, dealt with domestic violence in my childhood and faced difficulties in life," Ms Foster told the O Globo newspaper last September. As a child, she collected recyclable paper and cans to help support her family and buy her own schoolbooks. "I always studied because I knew I had to. I needed to survive and take care of my mother," she said in an interview with Valor newspaper. Ms Foster joined Petrobras as an intern, studying and working her way up the ranks. 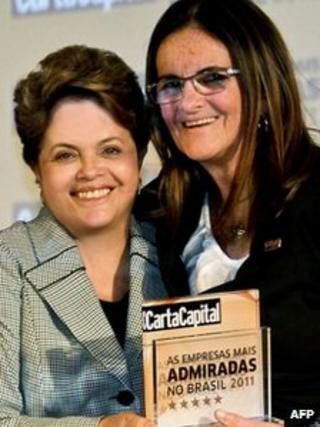 She has expressed her dedication to Petrobras, declaring that she would be "ready to die" for the company. Petrobras's share price rose when her nomination to succeed Jose Sergio Gabrielli was announced. This indicates market approval of her appointment, says consultant Adriano Pires. "Firstly, she has a more technical profile (than Mr Gabrielli) and has worked her whole life in Petrobras; secondly, she is close to President Dilma," he says. "Her main challenge will be to balance political and technical decisions. A trademark of Gabrielli's administration was that many decisions were political, and this has caused Petrobras's shares to drop since 2010." Ms Foster and Petrobras will indeed face challenges in the years ahead. The oil fields off the coast of Rio de Janeiro state are estimated to hold more than 50bn barrels of oil, but these are buried some 7km (4.4 miles) under the ocean floor beneath a thick layer of salt. Environmental issues may also come to the fore in case of any oil spills. And when the oil does really start to flow, expect heated political discussions over how and where the money should be spent. Video Why is the Brazilian economy booming?